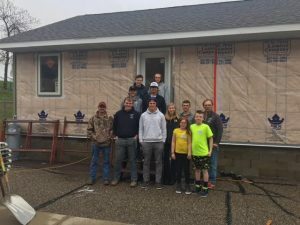 Why volunteer at Habitat for Humanity South Central Minnesota? Challenge yourself while helping others. Benefit your career and build your resume: develop new job skills, explore career possibilities without risk — all while volunteering for a great cause. Make new friends, build personal contacts, develop communication skills, and share your skills with others. Studies show folks who volunteer live longer and hold higher levels of self-confidence. By making a difference, having fun, and feeling appreciated, it’s clear to see why. Construction work is conducted year-round, weekdays 9 a.m. to 3 p.m., both indoors and outdoors. Saturday builds by appointment are also available. Volunteers are guided by our professional staff who teach the necessary skills to finish the job well. Volunteering at the job site is a great way to keep your body and mind sharp by combining physical work with problem-solving skills. Enjoy the vast variety of tasks construction work offers while experiencing the satisfaction of building a home for a family in need – from the ground up. Construction experience is not required. Be able to physically perform duties such as lifting up to 20 lbs. 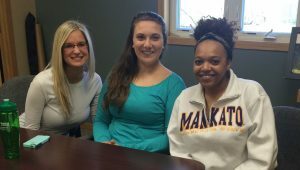 The office volunteer position is housed in our Mankato office. Volunteers perform a wide range of administrative tasks to support Habitat’s non-profit operational responsibilities. Duties may include filing, preparing mailing, grant writing, creating brochures or flyers, website updates, and data entry. Hours of operation are weekdays 8 a.m. to 5 p.m. Short-term or long-term, active or occasional volunteering is available. Internships not only build resumes for college graduates, but also provide job training aimed at showcasing marketable skills. By interning at Habitat, interns gain valuable real-world experience with the opportunity to make a difference in people’s lives, join in socializing activities, increase professional portfolio capacity, and foster personal growth. Internship hours are flexible: weekdays, 8 a.m. to 5 p.m. Occasional evenings or weekends for events may occur. All office interns will complete an orientation with staff highlighting basic office operations, ReStore donations, homeowner application assistance, phone etiquette, etc. Ability to lift and carry 50 lbs.